This post is based on the biblical story of Issac, as told in Genesis 26 and 27. You should read it. I like Isaac, the son of Abraham. Here’s a guy who was almost sacrificed on an altar by his father, but turns out fairly normal. He was a practical man, digging wells and making treaties. And he was a faithful man, who built altars to worship the true God. He was also a true monogamist, rare in his day and unlike his father and sons. He loved Rebecca from the day he met her until the day he died. It’s one of the tenderest love stories in the Bible, except for the time he tells the Philistine ruler that she is his sister. And except for the little spat about which son gets the blessing. It is hard to imagine she never told him God had chosen their youngest son Jacob to receive the Promise. But what’s a couple of arguments among lovers? Except in this case we are talking about the Promise with a capital P, the one given to Abraham. This covenant frames the entire story of the Bible, and yet Isaac is determined to give it to Esau. We are told in one place he loved Esau because he loved the taste of the game Esau hunted. This is a theme that runs throughout the narrative, not just the taste of game but sensory stimulation of every kind. We’ve seen his lack of self-control before, when the king of the Philistines looks out the window and sees Isaac “laughing” with his wife, a euphemism for sure. In some translations he is “sporting” with her, or “caressing” her. 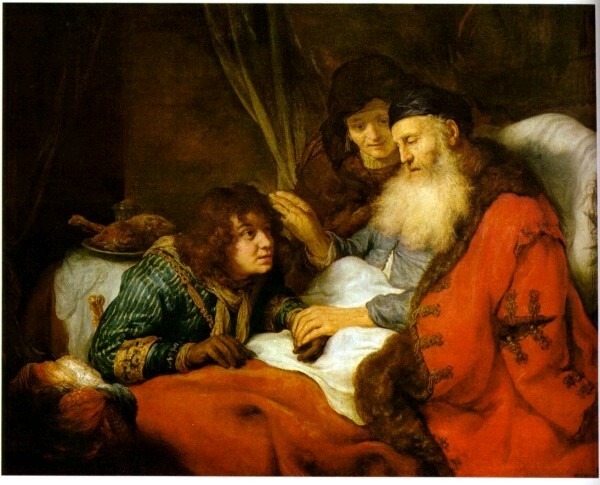 Even the blessing he gives Jacob (thinking he is Esau) focuses on sensory detail, the dew of heaven and the fat of the earth. There is nothing wrong with any of these things. Pleasure is not a sin, but a gift. But Isaac reached out to touch his wife when both their lives may have depended on his restraint. He wanted to bless Esau when the king of heaven wanted him to bless Jacob. I understand that Isaac loved his hairy, outdoorsy son. And I’m not excusing Rebecca’s scheming or Jacob’s lying. I’m just saying our appetites make a poor master. You have to wonder if Esau’s own weaknesses reflect his father’s? Esau trades his birthright for a pot of savory soup. And even though he has two Canaanite wives, when he looses the blessing he is so depressed he goes out and gets another one. As if that could help. And Isaac’s own appetite is both unwise and urgent. He acts as though this will be his last meal, even though he lives another 40 years. Does he choose Esau over the Lord’s own choice because he let his appetites rule his passions? Even his decisions? He wouldn’t be the first man to do so. Or the last. The recently released story of JFK’s affair with an intern adds to the list of highly respected pastors and politicians whose sensory focus led to bad decisions, if I can be euphemistic again. Perhaps this process begins with an extra helping of desert. Sin often begins with something good, like a juicy steak or even a kiss. But our principles must master our passions or we fail to know and do the will of God. Our appetites must yield to His authority; only then can our true delight be in God himself. Great post! Great insights on these men’s lives. Thank you Wally.